Search.playsearchnow.com is the PUP that uses misleading techniques to prevent removal. Use Reimage to locate malicious components and get rid of them faster than with uninstall instructions. A full system scan blocks virus reappearance and prevents traffic to malicious domains. Is search.playsearchnow.com a practical website? Search.playsearchnow.com virus allures users who seek for an effective search engine but at the same lively browsing tool. Therefore, it is not surprising that this search engine attracts the attention of many users. Nonetheless, there are some characteristics which diminish the possible advantages of this browsing tool. After you deliberately install this search engine or it sneaks into the device without primary approval, you might notice an excessive number of ads popping up in the browser. What is more, these commercial offers might emerge at any time and in any website. Additionally, installed plug-ins might also burden your browsing sessions. Therefore, IT specialists have categorized the search engine as a browser hijacker. In this article, you will get acquainted with the main features of this PUP category and find out how to remove search.playsearchnow.com from the computer completely. Reimage is one of the solutions. In overall, this search engine does not differ much from any other browser hijacker. It tries to catch users’ attention by offering shortcuts to relevant websites, like weather forecasts, shopping web pages, and social networks. Such utility is highly practical for others who especially value time and are used to accessing their preferred links just with one click. However, such utility may result in the series of annoying features. For example, after you start employing the search engine, you might encounter search.playsearchnow.com redirect tendency. Due to it, you might find yourself in a third-party website. 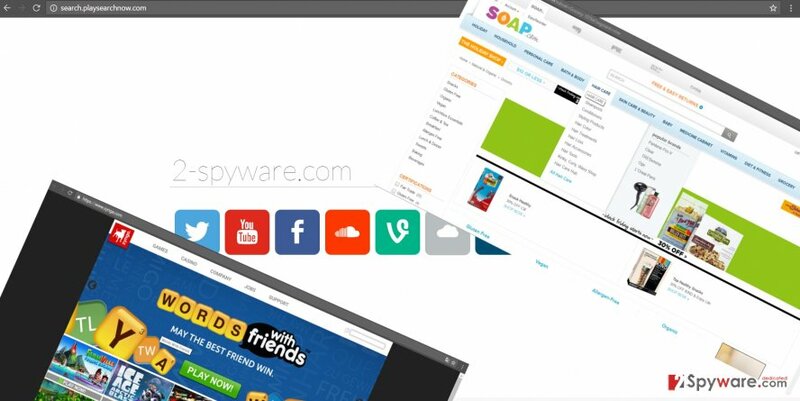 As you have noticed, Play Search Now promotes links to multiple third-party websites. Taking into account that the majority of hijackers are supported by unknown online companies, in return, the developers of the hijacker promote the content of third-parties. Likewise, the probability to get redirected in advertising or commercial website is higher. You should not pay a long visit there as you are not aware of whether they are secure. It is likely that one of the redirect domain may contain unwanted elements – malware – within. It tends to settle in users’ devices with the help of “bundling” technique. Its main principle lies in attaching unwanted applications to freeware. The users’ habit to rush through the installation wizard also facilitates such distribution method. When they click “Next,” the attachments are often overlooked. As a result, search.playsearchnow.com hijack happens. However, there is an easy way to avoid the infiltration of unwanted applications. Upon initializing the installation wizard, shift to “Advanced” mode. It will disclose optional tools. After you remove the checkmarks from unnecessary attachments, proceed with the installation guide. It is not difficult to eradicate the browser hijacker from the PC. You can remove search.playsearchnow.com virus with the assistance of anti-spyware utility. This application will ensure that no elements of the hijacker remain on the system. The updated software also reduces the risk of getting entangled by a more complicated virus. Alternatively, you find manual search.playsearchnow.com removal instructions useful as well. They will show you how to reset the respective browser settings as well. On the final note, pay more attention while downloading even a legitimate application. Blocking PUPs on time saves removal trouble in the future. Here, look for Search.playsearchnow.com or any other recently installed suspicious programs. Wait until you see Applications folder and look for Search.playsearchnow.com or any other suspicious programs on it. Now right click on every of such entries and select Move to Trash. When in the new window, check Delete personal settings and select Reset again to complete Search.playsearchnow.com removal. The additional instructions will help you launch PowerShell and eliminate the registry keys left by the hijacker. Once these steps are finished, Search.playsearchnow.com should be removed from your Microsoft Edge browser. Here, select Search.playsearchnow.com and other questionable plugins. Click Remove to delete these entries. Now you will see Reset Firefox to its default state message with Reset Firefox button. Click this button for several times and complete Search.playsearchnow.com removal. Here, select Search.playsearchnow.com and other malicious plugins and select trash icon to delete these entries. Click Reset to confirm this action and complete Search.playsearchnow.com removal. Here, select Extensions and look for Search.playsearchnow.com or other suspicious entries. Click on the Uninstall button to get rid each of them. Here, look at the Homepage field. If it was altered by Search.playsearchnow.com, remove unwanted link and enter the one that you want to use for your searches. Remember to include the "http://" before typing in the address of the page. Now you will see a detailed dialog window filled with reset options. All of those options are usually checked, but you can specify which of them you want to reset. Click the Reset button to complete Search.playsearchnow.com removal process. This entry was posted on 2016-11-21 at 04:30 and is filed under Stealing programs, Viruses. You can quickly scan the QR code with your mobile device and have Search.playsearchnow.com virus manual removal instructions right in your pocket. How did you remove Search.playsearchnow.com virus?